As I don't see an EDF forum I'll post some of my impressions of Freewing F-5 Tiger here under "Warbirds". Some background is in order. I received this model as a hand me down after the original owner crashed it on the maiden flight performing a classic rendition of the “Saber Dance”. While the model is an honest flier she is a handful and not suited for low time flyer or even intermediate flyers. One needs to have a lot of experience with models that have high wing loading to have success with the Freewing F-5. Unlike a lot of models here on Flight Test that fly great on flat foam boards, these higher wing loading models are very dependent on the airfoil’s performance. First lets get some of the construction out of the way. In the stock form the nose (battery tub) is far too weak. While Freewing does have some carbon tubes across the nose part line this really isn’t sufficient. I found that one really needs to add some additional support in the way of .014" x 0.25” carbon blades imbedded into the upper sides of battery tub. This added support kept the maiden crash damage to a minimum. As the damage was basically limited to the cosmetic damage to the bottom of the plane. Actual damage was 2 destroyed retract units, a torn off elevator and the loss of two blue sidewinders. The other major issue with the model, besides the weak nose, is that the main landing gear retract pockets are misplaced. 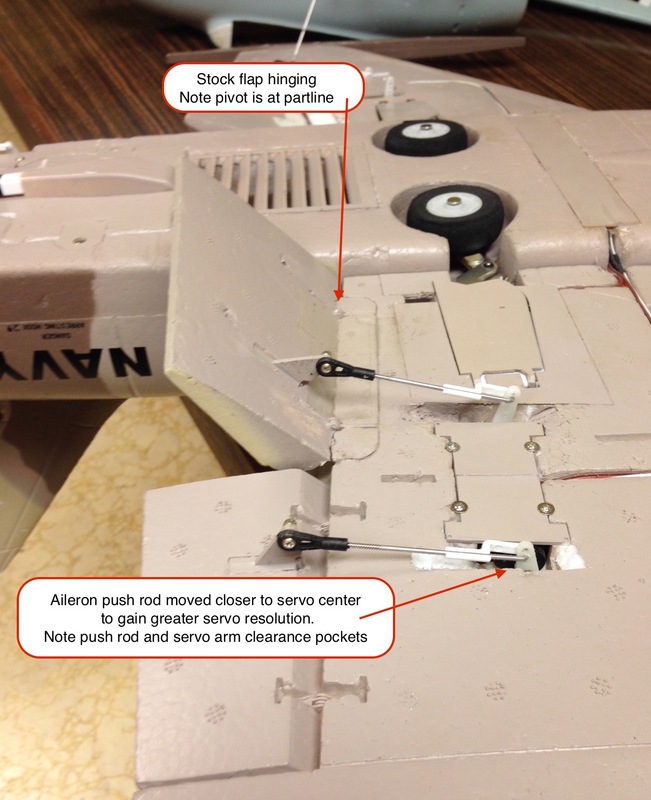 That is they are molded so that the retract mounting pads are parallel to the bottom of the wing. 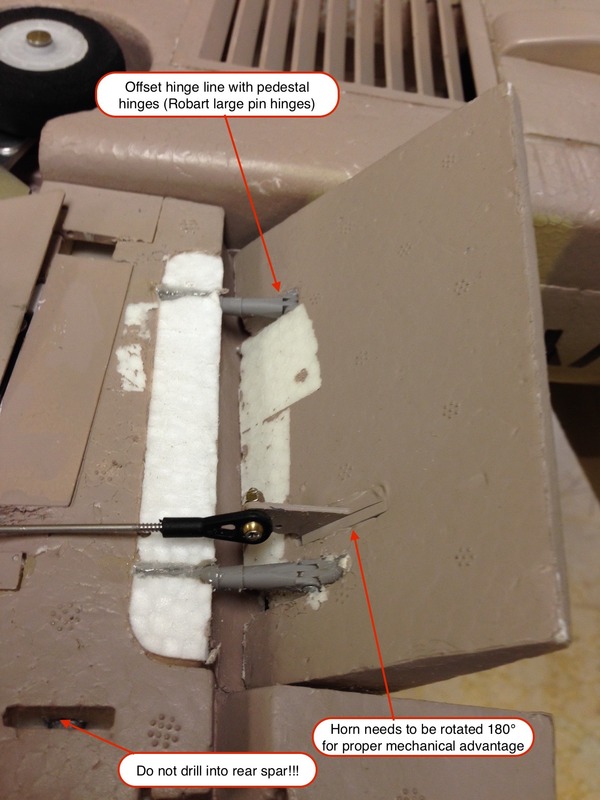 As a result of the wing's dihedral from the airfoil taper the landing gear will sit about 6mm proud, sticking out of the fuselage if one glues the plastic retract mounts down flush with the wing pockets. To get around this issue one should assemble the wings onto the the fuselage. Mount the retract unit to the plastic retract mounts. Then with the retract in the retracted position (up) glue the plastic retract mounts with the retract units into the wing retract pockets. Use a lot of very thick CA glue to fill the inevitable gap that will form at the outboard area of the mounting pocket, as you keep the wheels pushed up into their respective pockets in the fuselage. With the use of very thick CA I also like to use an accelerator on the plastic retract mount. The last issue is that Freewing doesn’t seem to understand the concept of servo resolution. To get the best performance from the servo one needs to use the full range of motion while getting the desired amount of control surface deflection. To that end move the aileron push rod as close to the center of the servo while maintaining the desired control throw at high rate. The servo should be allowed to move 100 to 110% (90° plus). The control deflection given in the manual are decent but rather high for a maiden. So be aware of this on your maiden flight. With the above modification the Freewing F-5 is a fine flying and durable model as long as one respects the high wing loading and limited power from the stock EDF unit. Now while I blame the designer in making a mistake with the main retract mounts I need to place the blame for the poor flap hinging on the MBAs (Bean Counters). The designer has made the flaps with close to a proper Leading Edge (LE). But to save 50 cents on the manufacturing cost of the model the bean counters (MBAs) did not want to pay for a new set of molds to make stand off hinges. Without the offset hinge line the flaps don’t work to near their potential. I’ve added some photos showing how, with large Robart hinges one can correct this MBA induced crippling. * The new 80mm Freewing jets are coming with a more powerful 1800Kv outrunner. This might make the power available adequate but still suffer the inefficiencies (power in vs power out) of an outrunner motor. I've just learned that there is a limit to the number of photos one can up load in post. 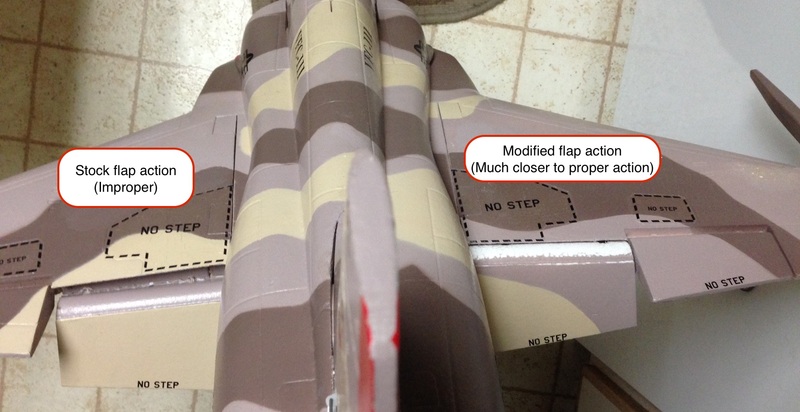 Here is the continuation of the flap modification to the Freewing F-5. I'm also showing where I place the RX with proper sized batteries. With the large heavy 6000mAh battery I had to place the RX in the dead space just ahead of the cheater hole. This gave me concerns with wires working their way into the rotor. While the F-5 did fly with the weight of the 6000mAh it wasn't fun to fly at 6000 feet altitude! The best performance I have seen is with the 6 cell Revo 4600 mAh 435 series battery. Some background is in order. 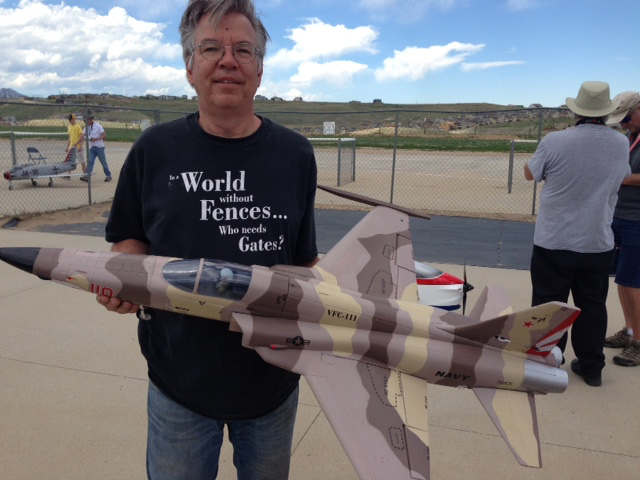 I received this model as a hand me down after the original owner crashed it on the maiden flight performing a classic rendition of the “Saber Dance”. Nice to be at the right place at the right time! No! Actually the crash was as a result of improper, or more to the point inadequate documentation! It pains me to see anybody loose $300. We as consumers need to hold those that supply us with products to the highest standards. We all work far too hard to be ripped off by money hungry fools bent on emptying out our PayPal accounts as fast as possible! I happen to have the skills to repair most things. I've been a machinist and engineer for most of my working career. So what most folks would throw away I'm often able to recover and place back into service. Truth be told this model should have been left in the trash can. Most of these EPO models are far too inexpensive to spend any real amount of our valuable hobby time repairing. They are to be blunt junk or at best toys, not "real models". Reading over the first post I see that I too failed to mention the cause for the Saber Dance. The root cause of the maiden crash can be traced to two issues. 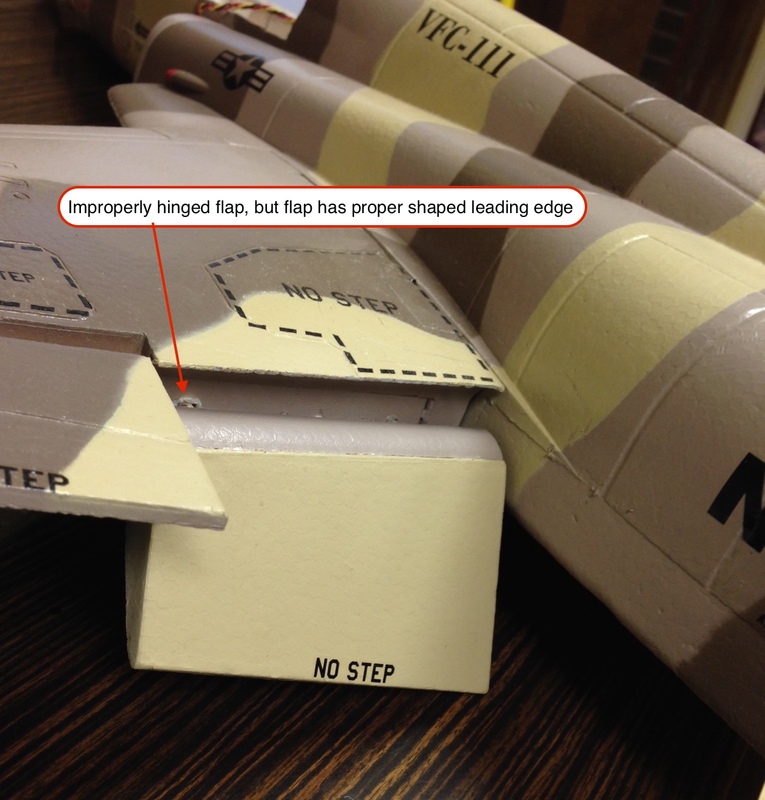 First and foremost is that the manual did not state which way the model will pitch as the flaps are deployed. Depending on the placement of the flaps and stabilizer, some planes will pitch up or pitch down when the flaps are deployed. On the Freewing F-5 there is a mild pitch up when the flaps are deployed. This is disconcerting on landing as one is forced to hold forward stick on the landing approach (opposite of what you normally do). If one does not hold enough down the model will get into a deep stall and no amount of throttle (power from the weak EDF system) or down elevator (no prop wash) will result in a recovery. On the Freewing F-5 one needs to mix in about 6% down elevator with the deployment of the flaps. Also the shape of the mixing curve should be asymptotic (more at the beginning) rather than exponential in shape. The total amount of mix is highly dependent of the placement of the center of gravity. The second reason was alluded to, lack of power from the weak outrunner motor. This was expected, in that all ducted fans show a marked loss of performance at the higher altitudes. So I can't really blame that on Freewing or MotionRC as much as I'd like to! Looking at the MotionRC site it looks like the manual has been updated to reflect this needed down mix with the extension of the flaps. Version No. :FJ208-V01, this looks to have been done sometime after or near the introduction of the Swiss livery. I did not see any mention of how to properly install the retract torque boxes (mounting plates). I see that on Hobby Squawk Pilot Ryan said he didn't need any mix. Wow. I guess some ARF's are better than others. I'm looking at a race wing now. Not an ARF, but it's some kind of foam. That statement is so true!!! Not sure what a race wing is, but most foam have material properties that would limit its desirability as a material for fast aircraft. EPO foam might be adequate in many ARF application if the designer and the consumer are aware of its limitation. I tend to think of EPO foam as the lead (PB) of the foam world. It lacks rigidity, is heavy is easily distorted and is not very temperature stable. Just the kind of properties we DON'T want in the materials we would build our model airplanes from! Now I would like to point out that there are firms that are making fine models out of EPO foam. One such firm is Multiplex. Multiplex fully understands the limitation of the material (EPO) and designs their models appropriately. I'm thinking of the Multiplex Heron. This is an extreme application, a camber changing 2.4 meter glider with a strong nod towards being a true high performance glider. Historically Freewing has been little more than just a plastic house desperately trying to keep their ovens working. 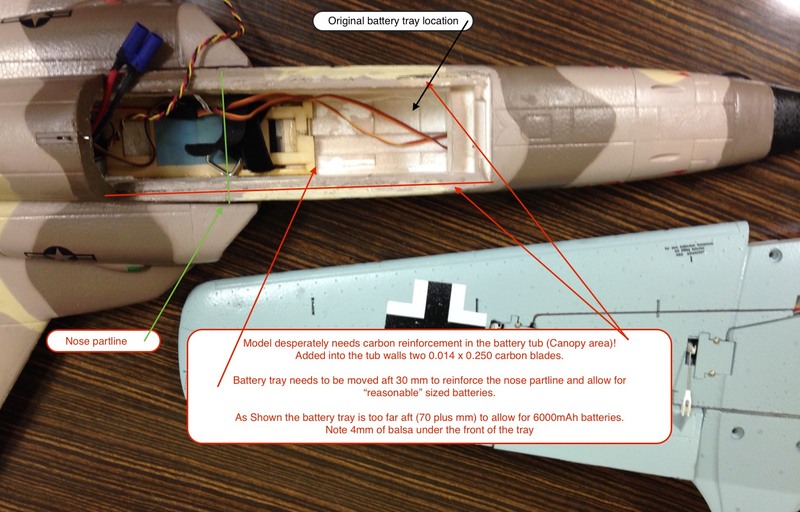 Their products have shown a distinct lack of understanding as to the demands of the model aircraft as it applies to the implementation of EPO in the model's construction. Their manuals also have shown a complete lack technical prowess when it comes to controlled flight. Combine these engineering deficiencies of a toy manufacture trying to make model aircraft with the added liability of having a exclusive north America distribution agreement with MotionRC and we the consumer are doomed when it come to real customer support for the Freewing product line. While I think it is important that the importer have stock on hand to support the product line they sell. It is in my view even more important that they be technically competent in support of the products they sell. In the case of MotionRC they appear to be experimenting with the new employment fad of remote employment. As a result the expertise of the founders is not cross pollenating to the new younger (low time hobby) employees, as there isn't the day to day or face to face exchange and supervision. I've been dumb founded at the lack of technical support from the customer support organization at MotionRC. For example one of their sales associated actually tried to sell me a gyro to address a control issue that was clearly a result of improper information in the Freewing manual. Unlike Horizon Hobby who has address control issues with say the center of gravity almost immediately with an addendum to the manual. MotionRC has dragged their feet at any indication that there is a problem with any of the products they sell. So the up shot of this, is learn the limitation of the materials used in your products. And find a firm to work with that has a track record of addressing issue that are important to you. For me a technical understand of the product is far more important that the quick turn around time for my orders (read, how fast they empty my PayPal account). Truth be told this model should have been left in the trash can. Most of these EPO models are far too inexpensive to spend any real amount of our valuable hobby time repairing. They are to be blunt junk or at best toys, not "real models". I will agree that these models aren't "perfect" by any means, but by no means are they truely THAT bad! Especially if you look around that market at other foam edfs. Not to mention, look how far they have come! My first edf was a V1 FMS 64mm Alpha Jet. Sounded like a vacuum cleaner, a very inadequate spar, frequent ESC issues including a fire, and couldn't even leave the ground of a smooth runway without the help of a substantial headwind! Other the past couple of years, I've bought EDFs from FMS, LX (BlitzRCWorks), eflite, and freewing, and Freewing has BY FAR the best quality jets between the three. LX in particular took bad to a new level, all of their planes required a rebuild from the ground up. They had no spars, terrible hinging, were terribly underpowered, extremely fragile plastic retracts that could break under STATIC load, and NO information in the manual of any use. And the EPS foam was permanently dented if you looked at it wrong. On top of that, they couldn't even get the scale lines of many airplanes correct. Starmax was an even worse offender in this department! Today, the Freewing models are more durable, powerful, and nicer to fly than most (if not all) other scale foam jets on the market. Sure, the nose could use a bit of reinforcement, but the wing and tail are well reinforced, and are not going to fail on you in flight. The gear have shock struts, and are metal trunnion retracts. You can still break them with a nasty landing on a thick grass field, but you're not going to break them in normal everyday use. The ESC and stock servos have also proven reliable so far in my Freewing jets as well (90mm F-16, 70mm F-104, 80mm F-86, twin 80mm F-14). As for propulsive efficiency, sure, its not the best. You can get a wemo, Jetfan, Stumax, or Tamjets if you really want to squeeze out that extra performance or flight time. Most stock edf units aren't as well engineered as those, and therefore less efficient. But, the Freewing units provide very nice performance especially at lower altitudes, and an awesome sound. The newer FMS units are giving them a run for their money though, and I'm hoping to see Freewing make some improvements to stay ahead of the game. Their new A-10 has actually taken a lot of community feedback and incorporated it into the design. The wing structure is carbon spars and plywood ribs, with hollow foam moldings the slide around them to limit wing flex. They developed a new 9 blade EDF that is more efficient, and even left the option open for switching the stock fans for 90mm units. As for MotionRC, I can't say it sounds like you've had the greatest experience with them, but mine has been excellent. They have come through several times in replacing parts that weren't meeting my expectations out of the box, both in and even out of warranty. That's a lot more than I can say for Banana, Nitroplanes, General Hobby, or even Horizon. As for the details that are incorrect/not mentioned in the manual, that is VERY unfortunate, and I hope that they are corrected. Before the maiden flight of ANY new jet or warbird that I get, I make it a MANDATORY step to search the RCgroups thread for recommended CG and control throws. I don't trust that any of the info is correct out of the box, the manual suggested CG for the LX F-35 was off by about 50% chord! After that, I have looked to double check info before flying. As they say, Trust, but Verify..
Not sure what the issue is with my statement. That my particular model should have been left in the trash can. Or that these EPO foam models are toy grade junk when compared to what we demand of "hobby caliber" products. I measure value as time (the dollar is just an abstract concept of time, your work). The fact that these toys are so inexpensive and can be assembled in the time it take to break in a set of batteries, is their strength and weakness. To bring the hand me down toy (wreck) back to serviceable condition took more effort and cost in replacement parts than it would have to just purchase a replacement. (This is the concept insurance companies use to total or repair insured items) The original owner was aware of this and ordered a replacement F-5 before he left the flying field. I was the fool thinking that there was some value in the wrecked airframe. As to EPO models being toy grade junk I would have thought that obvious. EPO is a horrible material. It is heavy (dense), not what we want in a material to build an airplane from. It's very flexible, necessitating the addition of a lot of sub structure or added dimension (thickness) to gain diminutional stiffness (refer back to the density of the material to see how counter productive this is). It lacks a nice surface finish, the beads result in an alligator scale finish. Its waxy surface all but precludes any kind of paint from adhering well. These last two properties make ii wholly unsuitable for scale models. And then there is the thermal stability issue. The bead continue to expand when subjected to heat greater than 30°C. It is unconscionable that model OEMs continue to offer dark models as most of us fly in the sunlight. Also when the model is exposed to heat of the great outdoors, EPO becomes even more flexible. This added flexibility results in control surfaces easily going into flutter as the plane reaches flying speed. On the face of it EPO is best left in car bumper. It takes a great understand of the material’s limitation and a well thought out manufacturing process to get a good flying, durable model from EPO foam. Most firms fall far short of this. And as a result in all good conscience the best we can say of most EPO models is that they are toy junk! Expanded Poly-Styrene (EPS) Is a much better foam to make a model aircraft out of. It is much lighter, stiffer and many paints adhere well to it. You will have noticed that most performance offering where weight is a prime concern have the model made of EPS. The better flying foam Ultra Micros are made of ESP. The thrust vectoring (hovering) jets like the Freewing SU 35, F-18 and EuroFighter all are ESP. So was the much better flying (early production) F-104. The stiffer nature of the EPS means that the model actually is more durable in the air (less likely to go into flutter). As to hanger rash it is true that models made of EPS dent rather easily, they are not fiberglass ship by any measure. Now Graupner had a molding process for Polystyrene that formed a hard shell. I recall a model called the Tipsy(?) that used this process. It stood up to hanger rash as will as most of my balsa ships. If this was a patented processes it should be coming off patent soon. So there might still be some hope for the foam model. So yes, for EPO it is as bad as I make it out. I’m sorry to learn that is could easily be even worse. It was the intent of the "information highway” that the short comings of product and firms can be openly exposed in forums like this one on Flight Test. Corporation have far too much power in being able to suppress less than flattering critiques with there huge advertising budgets. It is incumbent upon us the consumer to bring to light the short coming of products, if we hope to get improved product. I post not to hype a product or vendor, but rather to critique, with an analytical eye, the short comings and to offer work arounds. It is hoped that if one can cut through the sales hype that the end user will have a much better experience if he/she is aware of the products limitations prior to the purchase. I rarely compare a product with what else is out there. I try to find the limitation of a product and offer work arounds. It is hoped that bringing to light these issues, that both the customer and the manufacture can make use of the information. An upstanding firm will not be afraid to upgrade their product, be it hardware or customer support. I think Steve Jobs said: Don’t be afraid to obsolete your own product. Because it you don’t somebody else will. You might have guessed by my location that I normally fly at sea level. I can tell you that there is nothing like flying in the rarified air of 6K to 8k feet to bring to light the aerodynamic shortcomings in a product! RCGroups is not a very good source for unbiased data. Unlike Ezone of old, RCGoofs is more focused on protecting its ad revenue than helping its membership get the most from there hobby budget. For example RCG was asked by Great Planes to throttle my post about the poor materials, manufacturing and dissipative marketing practices of OS Engines. * RCG asked (ordered) me to stop making data driven post about the OS engine and to stop putting GP/OS’s business practices under such close scrutiny. I countered that they wanted to suppress my informed position on OS because GP was “sponsor” of RCG yet they were willing to allow the OS apologists to keep making uninformed ignorant posts about Sanye engine, as Sanye was not a sponsor. RCG reply was yes, so I happily took the banishment. My anger with RCG is that they have banned several folks solely based on their association with me. *I’m note sure exactly what GP asked of RCG as I haven’t seen the correspondents. But one of the Jims did say that I was annoying some, but that he was aware that wasn’t my intention. BTW; one should not confuse the Great Planes of today with the Grate Pains of yesteryear. As it is my understanding that the new Great Planes is under new management since 2005 as a ESOP. In the sprit of full transparency I need to make it clear that I have not suffered any financial loss as a result of MotionRC's technical incompetence. MotionRC has tried, with their punitive policy of not selling me any of the products they offer. This is in response to my embarrassing Martin and his sale staff after catch them in a bold faced lie, when they said they had no reports of over controlling with the ailerons on the Mirage 2000C-5. All I did was point to MotionRC’s own sales video where “Pilot Ryan" was screaming turn down the aileron throw to 45%!!! MotionRC still doesn’t understand how the delta wing is controlled in flight. But this attempt to obsolete my Freewing fleet by MotionRC has backfired as I now just ask my club members to order my support parts. This helps them cut down of shipping cost by crossing the $100 threshold. And it only costs me a day or so in delay. As engineers we know that it is data that will allow us to slip the surly bounds of earth, not sales or marketing hype! I too hope that FMS and Freewing step up and keep offering us the consumer better products than they are offering us today. I look forward to the new EDF units mentioned above. But as mentioned I'll need test and verify before I make any recommendations. Dynam may also have as high a failure rate but I only have one Dynam model, a Meteor, so my population is rather small. As the title of this thread mentions set up I should make some more comments on that. In the manual it states to have the low rate at a very low 55% for the rudder. This is to aid ground handling. Again this is ridiculous advice! One should not have to increase the pilot load while landing because Freewing doesn&#8217;t want to make a proper servo arm or tiller arm! As supplied the ground steering on the Freewing F-5 is grossly overly sensitive! Freewing needs to supply this jet and in fact most of their jets with a much longer tiller and a much smaller servo arm to get the ground handling under control. To have the pilot switching rate switches on the take off and landing is just asking for a crash! Also cutting down the resolution on the servo even the ground steering servo is just bad practice. As most of us often like to fly in some sort of cross wind having the rudder resolution crippled just at the point it is most needed makes no technical sense. It makes financial sense it you are selling aircraft and aircraft parts. Or to ask the pilot to switch to low rate just as the wheels touch the ground is asking for the model to go out of control should it bounce back into the air. The proper solution has been offered earlier. But shy of that one should take the ground steering servo out of the supplied Y harness and plug it into its own channel in the receiver. Then mix the rudder input to this servo. The mix ratio can control the ground handling. This way there need not be any compromise to the flight controls for ground handling! Another gross control issue with most Freewing models is that they often use Y extensions to electrically gang servos together. This might be acceptable for non flight servos. But for controls like the flaps it is very dangerous. 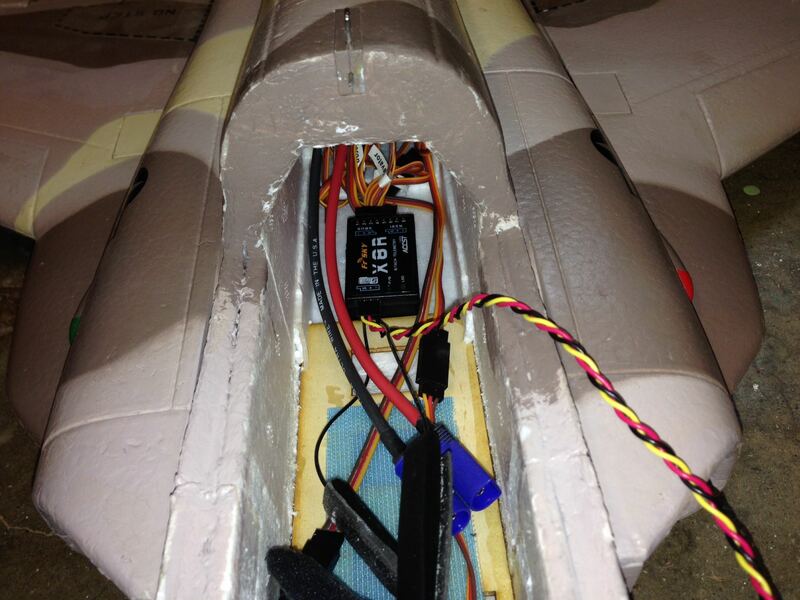 The issue is that freewing (and other low ed manufactures) to use match servos. This means that at the center pulse width the servo arms can be pointing as much as have a spline difference in any direction. This results in asymmetric geometry which WILL result in unwanted differential between the servos. This means that for the same servo rotation from the Y’ed servos the surface (flaps) will move a drastically different amounts (Ackermann effect). The proper way to set up the servos in these, and just about all, model is to assign each servo its own Rx port. This way any misalignment in the servo arms can be addressed in the Tx’s sub trim menu. In the old day of EK Logic Control, Kraft, Pro Line and other had the servo arms indexable with the feed back pot so as to be 90° from the servo at a pulse width of 1.5 mil sec. Today's low end servos do not have the ability to index the servo output and the servo arms. Please be aware of this if you notice abnormal response in your Y’ed control surfaces, be them the aileron, elevator or flaps. Try your best to assign each servo its own Rx channel. And use the sub trims to reposition the servo arms. This will mean that you will also need to make adjustments in the push rods to recenter. This is why I often use 16 channel receivers, and am so fond of the Multiplex and Fr-Sky radios, great value no matter how much you spend on them. I for the life of me don't understand why Freewing and MotionRC have these intermediate aircraft set up as basic trainer. The "Y" connector was a fine idea in 1970. But in the 21st century it is like asking us to control the models with Morse code. All but the toy grade Tx offer flexible programing. As much as I don't like the Freewing/MotionRC offering they (You) do deserve proper geometry in the control surface set up!